WFT's production department offers unique proprietary high quality embossing services that produce a wide variety of web products that include custom engineered structures, specialty film, labels, prismatic films, and packaging film. This service lends itself best to surface relief microstructures that demand the highest quality, including holographic diffusers (TMD(TM)), holographic optical elements (HOE), diffraction gratings such as rainbow, security labels, and prismatic or lenticular structures. Surface textures with depths of between 10 nanometers up to 200 microns have been embossed. 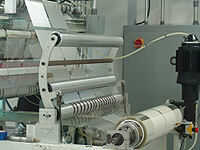 WFT has multiple casting lines custom built in-house that range from 6" wide pilot line up to 68" wide production line. 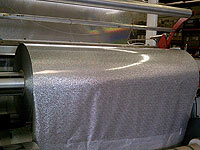 Rolls of material can be made clear for transmission products or coated with metal and made reflective. This material can then be adhesive coated, die-cut, and even laser numbered.